Create stunning presentations in a few clicks. The more advanced effects are always a few clicks away. Browse for backgrounds, effects or transitions on our website. 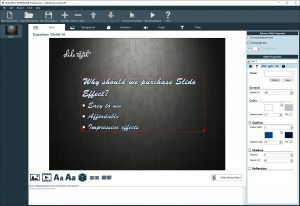 Slide Effect is a Windows presentation software to create professional quality presentations or slide shows in just a few mouse clicks. Do you want to create a business presentation, a photo slideshow for a demonstration or an interactive showcase? Slide Effect is exactly what you need! "I just wanted to take some time out of my life to say what a great piece of software this is. After creating one slide for a business presentation, I was convinced that this is the best way to go." Add effects to your texts, images or videos in a few clicks. Select a transition from the list and you are set with a stunning presentation. An intuitive software accessible from beginner to advanced user: Choose effects in a list, or create your own. Everything is possible. 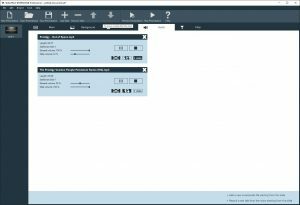 Add a song or record your voice using a microphone. Create the soundtrack of your presentation directly in Slide Effect. Slide Effect uses all the capabilities of your computer to enhance presentations: Filters and transitions can give a unique look to presentations. At any time you can edit or create new effects, transitions or filters thanks to the editor included in Slide Effect Professional version. Are you missing an effect, a background or a transition? 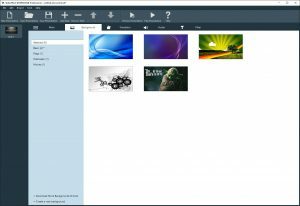 Just browse our effect repository to get the latest creations of the community. 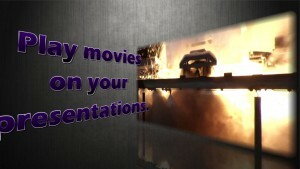 Do not hesitate, download Slide Effect and start creating the presentation of your dreams immediately. It's even free! Keep up to date with Slide Effect news!